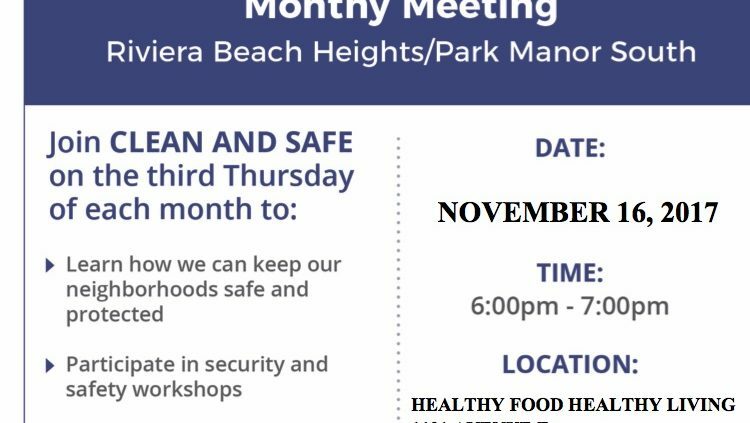 (Riviera Beach, FL – November 16, 2017) – The Riviera Beach Community Redevelopment Agency (RBCRA) (www.rbcra.com) will host a Clean and Safe Neighborhood Watch program monthly meeting every third (3rd) Thursday of each month. The first meeting will be on November 16, 2017, from 6:00 p.m. to 7:00 p.m. at Healthy Food Healthy Living, located at 1101 Avenue E, Riviera Beach, FL 33404. Residents will be provided strategies and best practices to keep their neighborhoods safe and protected and will participate in safety and security workshops in an effort to build strong neighborhood relations. One of the RBCRA missions is to create a welcoming environment that eliminates blight and improves the perception of safety in the area. 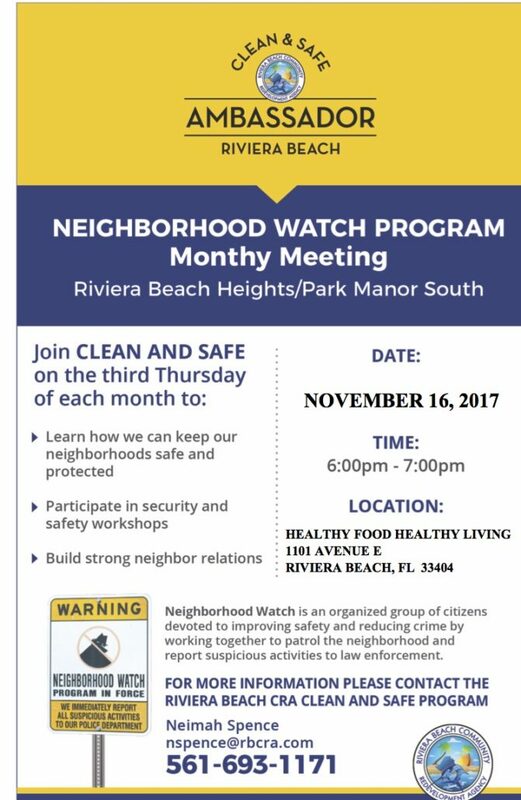 The Neighborhood Watch Program consists of an organized group of citizens devoted to improving safety and reducing crime by working together to patrol the Riviera Beach Heights and Park Manor South neighborhoods and report suspicious activities to law enforcement. Riviera Beach residents have the option to also join the Clean and Safe team. Meeting locations vary and will be announced each month. For more information please contact the Neimah Spence at nspence@rbcra.com or (561) 693-1171 or visit rbcra.com.